In the 1990s, Cibo Matto (“crazy food” in Italian) were an alternative band formed by two friends from Japan who met in New York. They made the kind of eccentric, catchy music that left you tapping your feet and scratching your head. Their debut album Viva! La Woman featured 11 songs about food (Birthday Cake, Beef Jerky, anyone?) and the duo went on to create eccentric musical dishes for the next several years. With a heavy cult following, that included numerous famous fans, Cibo Matto even appeared on TV show Buffy the Vampire Slayer, performing at the fictional nightclub, The Bronze, with Buffy and Xander in attendance. Now after 10 years apart, the girls are back together and making music as quirky and interesting as ever. Their new album Hotel Valentine is a concept album about a haunted hotel, with song titles including 10th Floor Ghost Girl, Empty Pool and Housekeeping. “I think in some way all the albums are concept albums,” says Yuka Honda. “To me the band alone is a concept and then there are the things the band are thinking about at the moment. 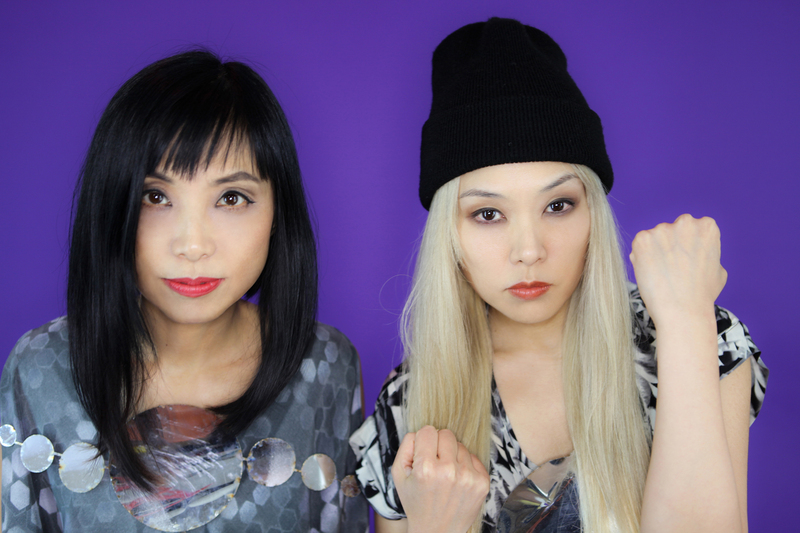 Reigniting the flame with fellow Cibo Matto bandmate Miho Hatori was a real thrill. The pair have a very special chemistry they weren’t fully aware of in their youth, she says. “We’re calling this time our second marriage,” says Honda. “Because it feels like the one in the 1990s we grew up much faster than we thought. Kind of in the way that you go out with someone in high school and you get pregnant and all of a sudden you have to start a family and jump into real life and you don’t even know if you really chose this person, you think, oh my god, things are happening. For a long time we were just trying not to drown because it was going so fast. The two met in New York in the early 1990s, where they lived, made music and partied in the hipster hotspot of the East Village. Honda says she wasn’t really drawn to New York at first, being more of a hippy “oceans and forest and nature” type person. But it seemed fate had other things in store for her. Talking Heads’ David Byrne was an early fan, attending one of their first concerts, and Warner Brothers records signed them on the strength of a demo cassette. Their music was an unusual cocktail of influences from all directions that made other bands seemed bland. But most of all, they were having fun. Honda remembers wild times, creative collaborations and relatively inexpensive living. “The ’90s was the beginning of the gentrification of New York. The East Village was exciting and happening and everything was really cheap. You could go out with $10 and have a pretty good time all night. Also people were very creative. They’d get together for a party and there would be a DJ in a tree and fire and jugglers. We were creative, doing things for fun. And now you can’t really do it. There’s no space. Living is costly, certain things have definitely disappeared. Honda still lives in an enviably cool situation now, sharing her living space with three other humans, as well as dogs and rabbits. They continue to be creative and crazy. The band has worked with several fascinating people in their time, including The Beastie Boys, Tricky and Luscious Jackson. Their current record features the uber eccentric musician and comedian Reggie Watts, who Honda describes as “one of the most talented human beings I have ever witnessed”. Cibo Matto also worked closely with Sean Lennon, who for a time was in the band. He and Yuka were a couple for a number of years, and remain friends. She produced his 1998 album Into the Sun, and he even took the promotional pictures for their current tour. Yuka still works with Sean’s mum Yoko Ono, performing with the Plastic Ono Band and co-produced Ono’s 2009 record Between My Head and the Sky with Sean. While Cibo Matto have a huge following in the West, in their own country, they aren’t so well known. Honda says that now that she is far from Japanese culture she appreciates it more. “When I was growing up there I hated everything Japanese. It seemed very slow and a lot of things seemed meaningless. Like tea ceremonies, where people are sitting around for an hour,” she laughs. “I was like, what the hell is this? What’s the point? Now I see the beauty of stillness and space and emptiness and waiting and attention and manner. All the things that seemed boring to me I see the meaning a lot better now I’m far away. “It’s pretty wild. It’s a very old country and has a long history. The other part is the eternal teenager, constantly doing crazy wild things. I’m always very excited by a lot of things there, including food, TV shows, books. As far as gender representations are concerned, Japan has both extremes, but she says in some ways women’s traditional roles are more respected than in the West. Honda’s own influences are far and wide, having grown up around the world. Travelling with her parents, she lived in not only Japan but Germany, Denmark and France. And in a surprise Australian connection, her brother even went to high school in Brisbane. This entry was posted in Adventure, Brisbane, Music, Travel. Bookmark the permalink.